Last night I watched the original version of the film, "Death Wish" with Charles Bronson, after seeing it once over 30 years ago. I was not a gun person at the time. What prompted me was watching the updated version with Bruce Willis, a few weeks ago. Watching the scene in the original film where Bronson's on screen wife is murdered and his daughter sexually assaulted was still disturbing and difficult to take. What struck me about the older film, however, is how much the updated version with Bruce Willis was "sanitized." In the original film, Bronson's character travels to Arizona where he shoots a handgun for the first time many years after he was in the military. His host at the shooting range tells him how criminals in Arizona are dealt with. Similarly, the police, DA, and the head of the police commission in the original film note how crime is way down as the results of Bronson's vigilante's characters actions. Political correctness is definitely apparent in the current version. If you have never seen the original film, it's worth a look. CG11, Gabill, Havok and 9 others like this. Two handed shooting's come a long way since that film was made. Gabill and G26Raven like this. Hollyweird must put their politically correct spin on everything, whether it's entertainment or the news - or is there a difference now??? Gabill, msgt/ret, G26Raven and 1 others like this. G26Raven and wizard7mm08 like this. I love the original, the new remake with Bruce Willis sucked. Watch the original and the 32 caliber looks pretty impressive. I like how in the original, Paul Curzy doesn't hunt down his wife and daughter's attackers, he just puts himself into positions for some vigilante justice. The original is also available on Amazon Prime right now. Well, I'm off to Emmet's fix'it shop...to fix Emmet. airslot, OldChap, msgt/ret and 3 others like this. I liked all of the original Death Wish series. I just watched the Willis version a couple of weeks ago and I liked it also. The Willis version makes me wonder if they're going to do at least a trilogy for the new Death Wish. Interesting, I haven't heard Hollywood complain much about gun violence in the movies, either past or present. I saw a YouTube video with Willis being interviewed and it seemed that he was pro-2A. airslot, OldChap, Gabill and 1 others like this. G26Raven and OldChap like this. Meh, I'm not a huge fan of the old or new one. Harry Brown is much better. I do like Bronson though; Great Escape, Once Upon a Time in the West, 10 to Midnight. One of the original "tough guy" actors that was real. Actors like Caine and Niven, Audie Murphy, Jimmy Stewart and Kirk Douglas, Eastwood, McQueen, Robards, Hank Fonda, Jim Garner and Borgnine and Strode...there were a bunch of them back then. airslot, Instymp, OldChap and 6 others like this. I wonder how many of the younger generation have a clue their beliefs and opinions are being intentionally influenced by TV shows and movies that have become thinly disguised leftist liberal propaganda? Risasi, NECCdude, OldChap and 2 others like this. I don't think it was anti-2nd at all. Why would you say that. It wasn't the masculine tour-de-force like the 1st, but it I thought it was appropriately adopted for the times. In the end - it still had the same message - want protection, get a gun. It definitely was more personal than the original commentary on making the world better by taking out some thugs. CDW4ME and maxwell97 like this. I'm not sure if that is true or not. Certainly a great many more shooters were more highly skilled in off-hand (one hand) shooting then than they are now. The big benefit of two handed shooting is that it allows older shooters to shoot as well as they could have when they were young and the hands didn't shake! @G26Raven I find the huge majority of modern re-makes suffer from the same brainless, drug soaked, Hollyweird bungling. BTW...This is an NRA 50 yard target (B-6). 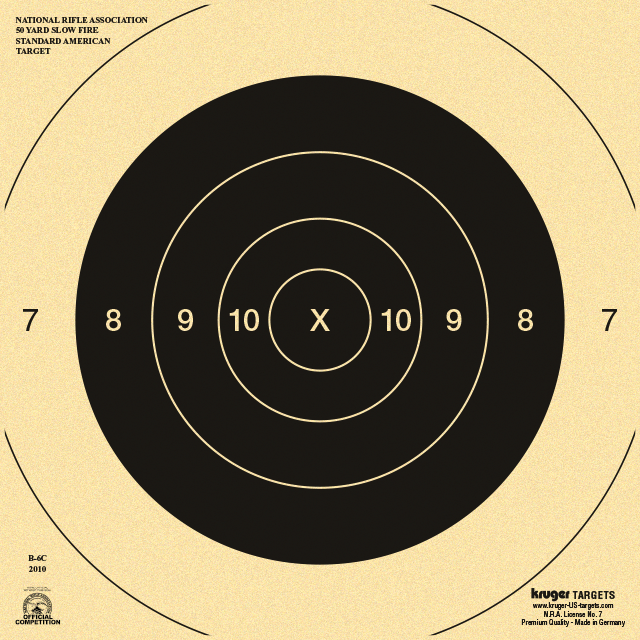 I shot many groups with 9 of 10 shots in the 10 or X ring. The diameter of the black bullseye is 8 inches. G26Raven, airslot, matthew03 and 2 others like this. Re-watch it sometime and listen to the constant advice from other characters, you may change your mind. Even this version of the protagonist had qualms about owning a gun. It wasn't blatant but the sentiment was there and very apparent. Look at my comment, even members of this forum are fooled by the vailed anti-gun sentiment. OldChap and Struckat like this. I didn't get that impression at all. I can't think of a single line that hinted at an anti-gun bias. I was more surprised by the "sanitization" in terms of the violence. The director is known for extremely gory shock films, and there was really only one scene that went beyond a typical action movie in terms of graphic violence.